Google is offering some new machine learning-based ad optimization toolsto help businesses maximize their opportunities via Google’s ‘Responsive Search Ads’ option. Released earlier this year, Responsive Search Ads enable advertisers to set up a single ad with multiple headline and description options, which Google can then use to show different combinations to relevant audiences. Based on its machine learning tools, Google can then use the results of its tests to optimize the creative combinations for best performance, based on your campaign goal. To further improve the offering, Google will now enable advertisers to view previews of different ad combinations as they compose them, which will make it easier to add in a range of headline and copy combinations, and get a better understanding of how consumers may see them. They’re also adding in ‘Best Practices’ pop-up notes to ensure advertisers include all the relevant details. In addition, Google’s also giving advertisers the ability to view current reporting stats available for different headlines, descriptions, and combinations of the two, in order to highlight what types of ads are seeing the best results, and help improve your efforts. 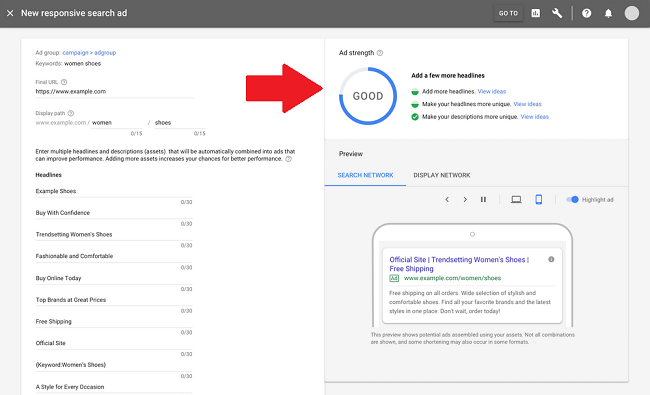 Google’s also rolling out a new ‘ad strength’ indicator at the top of the responsive ad composer screen to help ensure advertisers include all the relevant detail to maximize performance. Google’s Responsive Search Ads provide business with the capacity to effectively A/B test their ad copy without having to do the legwork themselves, with Google’s machine learning systems detecting and optimizing ad performance based on uploaded copy. Provide as many headlines and descriptions as makes sense for your business. If you’re having trouble getting started, we recommend focusing on creating at least 5 headlines. For a responsive display ad, provide up to 15 images and 5 logos, headlines, and descriptions per ad. Initially, businesses could only upload three headlines, so it’s clear that Google's boosting its capacity in this regard, which should enable improved performance optimization. Google’s new ‘Ad strength’ indicator will be available in early September, while support for responsive display ads will be available ‘within the coming months’.